If you have been following us, you would have read about our little 'war' with Hasbro . On Friday 2200, we decided it is time to settle the score at Toys "R" Us Forum. Get ready for TRANSFORMER : AGE OF EXTINCTION Toy Madness @ 2200! All geared up in FOX and ready to Roll out! The event was held to release the TRANSFORMERS Figures from TRANSFORMERS : AGE OF EXTINCTION Move. This was our first official toy launch and we were wow over by the event. To start off , there were AUTOBOTS the mighty Optimus Prime and the fan's favourite BumbleBee waiting for us at the entrance. It is also a crime not to take photos with these magnificent warriors. Our mission for this event was to find a toy each for the boys. Given how disappointed they are at the 'empty box saga', it is the very least a doting Dad would do to brighten their days. It was not long before the rows and rows of TRANSFORMERS caught thhe boys' eyes. In fact, the collection was so mind boggling that it was difficult to decide where to start. To kick off , we took a look at Hasbro's TRANSFORMERS : AGE OF EXTINCTION Line for 2014. This 2014 line features innovative new play patterns which includes one-step changes and flip to change action - designed to make TRANSFORMERS more kids friendly. This line features favourites like Optimus Prime and BumbleBee and new AUTOBOTS like Drift and Hound. Given how 'complicated' a TRANSFORMER toy can be for the younger ones, this range should be the toy of choice for them. For the bigger lads and 'older' generations like the adult fans of TRANSFORMERS (and there are many! 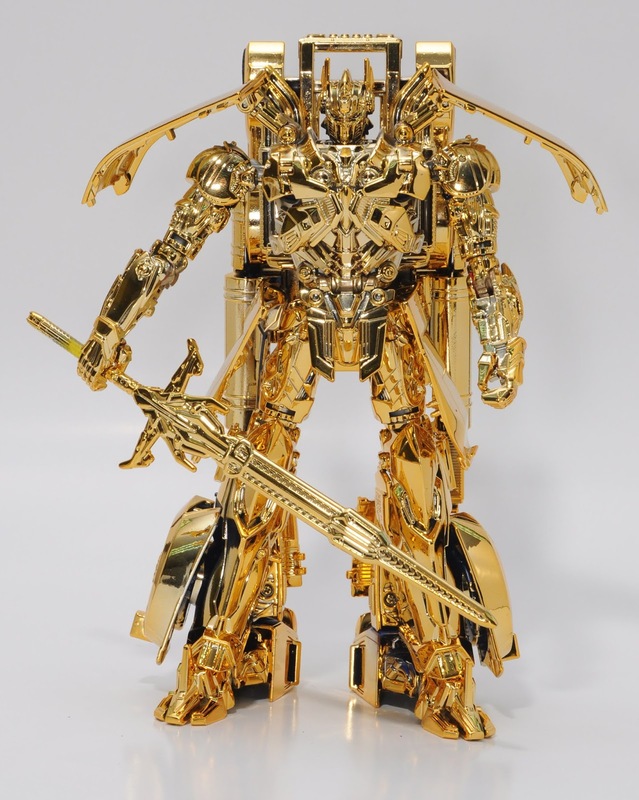 ), TRANSFORMERS GENERATIONS figures which feature classic conversions and detailed and accurate action figures from the latest movie and throughout the brand's history. For us, we will be searching from the First Edition Optimus Prime ( $119.90) that was introduced to us earlier in the week. In addition to the GENERATIONS line , there are also the TRANSFORMERS CONSTRUCT-BOTS. These figures let kids build and customize their own TRANSFORMERS robot action figures. We reckon that these would definitely add more creativity to play. If you are a fan of KRE-O, there are also TRANSFORMERS : AGE OF EXTINCTION range featuring the new DINOBOTS from the film. You can also chose to pick up a Micro Changers Blind bag featuring one of the TRANSFORMERS KREON figures at $6.90. For fans of TRANSFORMERS toys, the most anticipated event for the evening would be the launch of the 2nd Wave of TRANSFORMERS : AGE OF EXTINCT Deluxe range. Do be prepared to bring a bigger wallet if you intend to visit Toys"R" Us for the TRANSFORMERS range. and TRANSFORMERS MR Potato Head version. 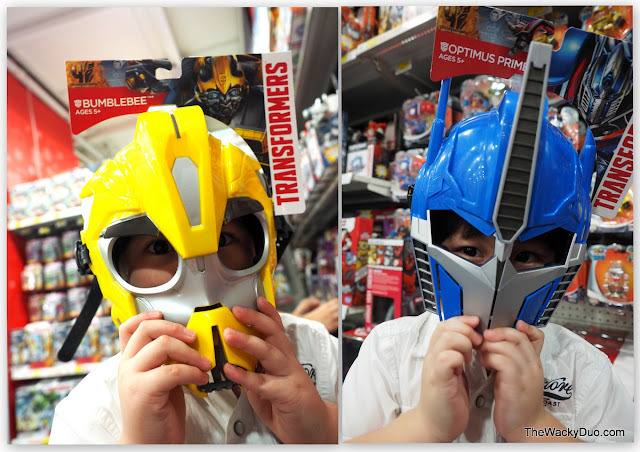 If you intend to be a TRANSFORMER instead, the BumbleBee and Optimus Prime masks ( $19.90) should come in handy. For the full range of TRANSFORMERS products , do check out Hasbro website. Since we were invited as Media, we had the luxury to choose the toys we wanted first. However when the clock strikes 22:00, that was where madness began. There were queues snaking from the second to the fourth floor of FORUM. This was our first time witnessing such a long queue for toys ( not counting Hello Kitty) and it attest to the popularity of TRANSFOFMERS with the locals. With Ah Boys to Men cast kicking off the countdown, it was an extraordinary sight to behold. We spotted more adults than children in the queue. The ones that ended with the biggest bags are the adults fans of TRANSFORMERS. I guess all of them have eyes on the big prize for the evening that goes to he biggest spender... the Gold Plated Optimus Prime. Being an Adult fan of Toys myself, I do understand the obsession with toys and man. I may not be as fanatic as most when it comes to TRANSFORMERS, but I do go a few miles for other franchises. That said, collecting toys have now become a lucrative venture if you have the acumen to pick the right toys. At the same breath, it had also affected the accessibility of certain toys to where it matters... the children. As for me, I let my children play with my collection or rather, they allow me to play with theirs. Honestly I do not think adults collectors would do the same as it would 'devalue' their toys. Ultimately, I do feel that it is a waste if toys are just bought for display rather than play. Back to the main show. Prior to the event, we were entertained by the cast of Ah Boys to Men / Lion Men. They are Wang Weiling , Tosh Zhang, Maximillian and Noah, who were there as special guests. Ever since watching 'Ah Boys to Men' and 'Lion Men', the boys are fans of the group. It is almost a daily affair in the house to watch either the movies or the youtube music videos featuring them. So it was a bonus that they managed to catch them in person. The guys are friendly and very obliging in taking photos with their fans. Big C had the opportunity to take a photo with one of his favourite - 'Lobang King' Wei Liang . Its a pity Little Lou got a little overwhelmed and did not join in the photoshoot. At the end of the day, our battle with Hasbro was resolved with a peace offering. The elusive Optimus Prime that was missing in the box had found his home with the Wackies. Thanks Hasbro Singapore for the Gift! For the record, we did not really have a 'war' with Hasbro. Rather it was an interesting marketing engagement that started with an empty box that piqued our interests. From end to finish, it was one of the best event we had attended to date. I guess being in the presence of so many toys for 2 hours together with the opportunity to see their favourite actors will get the thumbs up from the boys. For the latest range of TRANSFORMERS toys, do head down to Toys "R" Us for a piece of the action.